The main aim of Physical education in St Michaels College is to develop the all-round personality of an individual which includes physical, mental, social, emotional, and moral aspects. To promote Physical Education as a meaningful learning experience. To encourage the individual to strive and work towards their own targets in all aspects of Physical Education. To encourage individual pupils to participate in a range of physical activities or sport and to encourage a greater awareness of the body and its abilities, limitations and mechanisms. To encourage a healthy atmosphere within the Department. To promote ideals of sportsmanship and sport for sports sake. To encourage a long lasting participation in physical activity in one or more of its many models. To ensure that each and every individual has the opportunity to develop their skills to the full. To provide and develop information and experiences relevant to the career provision available in physical education, recreation and leisure industries. Wellbeing in junior cycle is about young people feeling confident, happy, healthy and connected. PE contributes to the Wellbeing programme by providing learning experiences which support students in being better able and more motivated to include regular physical activity in their lives, thereby contributing to their overall experience of wellbeing. Physical education fosters the balanced and harmonious development and general wellbeing of the child through a diverse range of experiences providing regular, challenging physical activity. Physical education provides all students with enjoyable and worthwhile learning opportunities where they develop their confidence and competence to participate and perform in a range of physical activities. 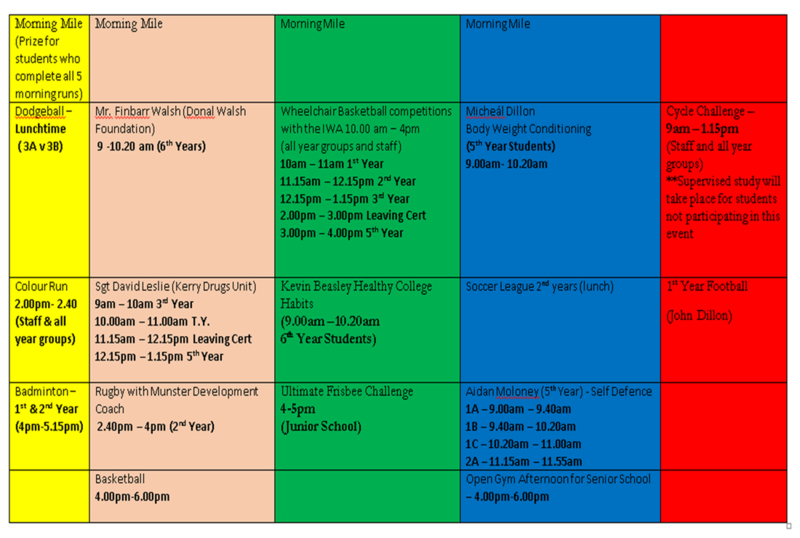 Students in junior cycle are at an important stage of their lives where they are making their own decisions about if and how they will include physical activity as part of their lifestyle. Learning in physical education is designed to ensure that students appreciate the importance of participation in regular moderate physical activity not only for their physical wellbeing, but also for their psychological and social wellbeing. By providing a broad and balanced range of activities, physical education aims to build students’ motivation and commitment to participate in regular, enjoyable and health-enhancing physical activity. Education for physical and mental health should not be seen as separate but rather as an opportunity to make connections between lifestyle choices. PE module -10 weeks swimming/gym/ aqua-spinning at Ballybunion leisure centre (used to fulfil physical recreational element of Gasice Award GAA Coaching Course (Workshop) 26k Gaisce Adventure Journey First Aid Course TY physical development module. Games (Unihoc, Basketball, Soccer, Gaa, Frisbee, Olympic Handball). Surfing Rock Climbing/Orienteering/ Spinning Classes. Health Related Physical Fitness—developing learners’ understanding of health related physical fitness now and in the future. 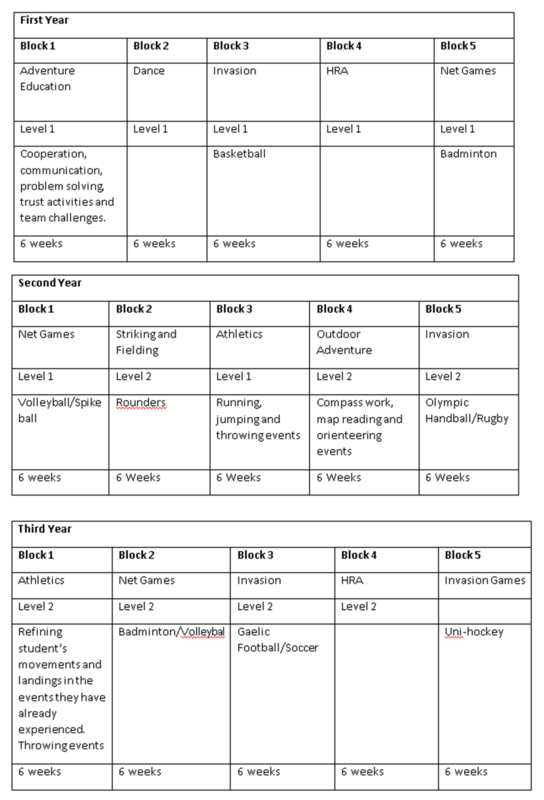 Sport Education—providing learners with an enjoyable and authentic experience of organised physical activity as they learn to perform playing and non-playing roles. Contemporary Issues in Physical Activity—encouraging learners to critically reflect on their own and others’ experience in physical activity and sport. Adventure Education—encouraging learners to challenge themselves and co-operate with others as they learn to solve physical activity challenges. Personal and Social Responsibility—encouraging learners to take responsibility for themselves and their learning in physical education class including respecting the rights and feelings of others. Teaching Games for Understanding—develops learners’ tactical awareness and decision making skills in a variety of games. The day started with the morning mile at 8.30am at the gym, all students and teachers were encouraged to take part. On Friday, at the start of each class period each teacher took on a student in a specific task. The task took 5 to 10 minutes max! How do we decided which student takes on the teacher? Not all students may feel comfortable doing this task in front of the class, so it is important to offer them a choice. Any student that would like to partake will raise their hand. Teacher will pick a number from e.g. 1-20, writes it down, asks each student to pick a number. Student that picks the correct number will represent the class in the challenge against the teacher. What challenges did we do? Hand Hold – who can hold their hands out straight for the longest without letting them drop – can hold a water bottle/weight in each hand to make it more challenging. Balance – who can stay on the balance board the longest, while holding wooden egg and spoon. Ball and bucket shots – try and shoot tennis ball into bin/bucket – who can get the most in the bucket in a minute wins or student/teacher can take 10 shots each, whoever gets the most wins. Teacher who has a classroom near the ping pong table can take on the student in a quick game of ping pong -first to 5. Skipping – who can get the most skips in a minute (ask Ms Scanlon for skipping ropes). Teachers can pick a particular challenge from the list and do that challenge at the start of each class, or if they have an idea for a challenge themselves they are more than welcome to do so. Taster Sessions: So far this year we have had rugby taster sessions from our Munster development officer and beach volleyball taster sessions from beach volleyball Ireland! There are so many physical activity opportunities available to teenagers in the local area. Our active school committee have researched and found a variety of clubs in the local area that can hopefully accommodate all interests. There are various walking and running routes around the Listowel area. St Michaels College is connected to Listowel town park which can be seen in the picture below. The Park has a variety of interlinking trails that people can choose from. We have an school run every Friday morning, which starts at the school gym at 8:30. Students and teachers run the outer lap of the park before the first class. The initiative started as TY project last year and has been very successful since. It is called morning mile with a smile! Ballybunion is just 10 minutes from Listowel is and here there is a cliff waslk. Bromore Cliffs are, quite simply, spectacular. A walk through this area of scenic beauty is the perfect way to spend a morning or afternoon. The walk along the cliff top is safe, easy, well fenced and suitable for all ages (of course children must be supervised). The sheer 180-foot cliffs have been sculpted by nature over thousands of years.